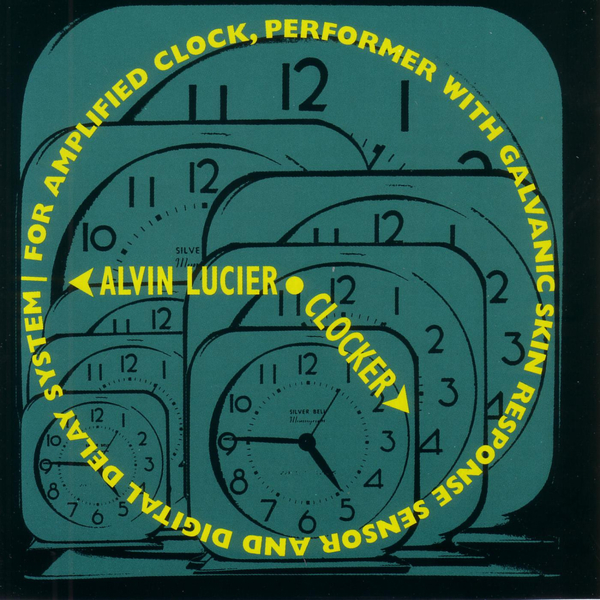 "Through the means of a galvanic skin response sensor driving a digital delay on a miked clock, Lucier creates the illusions of time expanding and contracting, and of a room that is changing in size. Another classic Lucier catalog item, a 45-minute recording made in 1991 of this piece that he first conceived in 1978. The piece is for: amplified clock, performer with galvanic skin response sensor and digital delay system. The sounds that emanate are beautifully shifting patterns of tock-collage that reveal dramatic sonic detailings. "I wanted to make a work in which a performer could speed up and slow down time, stopping it, if possible, simply by thinking. I bought a Westclox Silver Bell Monogram in a local store and ordered a galvanic skin response sensor through the Edmund Scientific Catalogue. A GSR is designed to measure differences in skin resistance caused by changes in emotional state. A small current is sent through the body, the response to which is amplified, producing an output voltage which can be used to control various devices...later I added a bank of fixed delays which, as they splay out from the voltage controlled delay, create multiple reflections that almost convince the listener that the room is changing size."